10th January – London UK. Ready Camp, the fast-growing glamping brand from The Camping and Caravanning Club, has added six new locations for 2018. 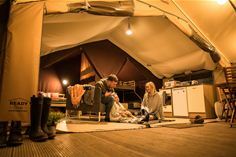 The ‘super six’ new sites bring the total of Ready Camp locations to 44 in the UK with a total of more than 200 well-equipped, pre-pitched safari-style tents. Ready Camp was first launched in 2015 to attract new people to the pastime while also appealing to those who like spending a night under canvas but with a few more home comforts. Last year Ready Camp revenue broke through the £1 million barrier for the first time. Bob added: “The ‘super six’ sites added to this year’s line-up are found near town, country, hills, moors and coastal locations, are ideal spots for glampers to get out and enjoy our great British countryside. “According to the travel association ABTA, the staycation is set to continue in the year ahead with two-thirds of people planning a UK break*. Our Ready Camp tents are an ideal way for holidaymakers to support that trend, which in turn supports both the local and broader UK economies. Each safari-style tent comes well-equipped. Campers need only bring their bedding, towels and a sense of adventure. For parents of little ones, there is also a triple bunk bed and a single stow away bed. On-site facilities are of a high standard, and benefit from regular investment; washrooms are within walking distance of each tent and make the prospect of midnight trips to the loo with little ones a lot less scary. Since its launch, Ready Camp has been recognised in several industry awards programmes. In its first year, the website www.readycamp.co.uk won the coveted ‘Best Travel & Holidays’ accolade at the eCommerce Awards for Excellence. Shortlisted in the Best UK Accommodation Group category in the 2016 Family Traveller Awards, Ready Camp went on to win the award ‘Best Holiday Rental for Families’ in 2017. For more information on Ready Camp visit www.readycamp.co.uk. *ABTA Travel Trends Report 2018. Ready Camp is owned and run by The Camping and Caravanning Club, which is 117-years-old and is the largest and oldest Club in the world for all forms of camping. It has more than 100 award-winning sites throughout the UK and, through a partnership with the Forestry Commission, now runs and manages a further 15 Camping in the Forest touring sites. Ready Camp is yours to explore and is accessible to anyone; all you need to bring is your own bedding, towels and tea towel. All other equipment and utensils are provided. To view a list of equipment included in each Ready Camp tent, please visit: www.campingandcaravanningclub.co.uk/Readycamp/faqs/. Bookings are for a minimum of three nights. Three-night stays commence on a Friday (Friday-Monday), four-night stays commence on a Monday (Monday-Friday), seven-night stays can start on a Monday, Friday or Saturday, ten-night stays commence on a Friday, while 14-night stays can start on a Monday, Friday or Saturday. Tents sleep up to six, to include a maximum of four adults. Prices start from just £27 per tent, per night, in low season. Get involved: for the latest news, information and inspiration from Ready Camp, visit www.facebook.com/readycampuk, www.twitter.com/readycampuk or check out our Instagram page www.instagram.com/readycampuk.